April 03, 2019: According to the media reports, the CBSE 12th Results 2019 will be declared, in the month of May 2019. Most years, the CBSE Result 2019 Class 12 is announced towards the end of May. Last year that is in 2019 the CBSE results for class 12 were declared on 26 May 2018. This year as well, examresults.net will be updating the date and time of when the CBSE Class 12 Result 2019 will be declared. This announcement will be made by Central Board of Secondary Education. All students, private and regular, can check their CBSE 12th Result 2019 here on this page. The Central Board of Secondary Education will conduct the CBSE Class 12th Examination for the academic year 2018-19 from 15 February to 3 April 2019. The detailed time table is available here. The Board will declare the CBSE Board Class 12 Result 2019 on the official website (cbseresults.nic.in) of the CBSE Board and on examresults.net website as well. The Central Board of Secondary Education will conduct the CBSE Class 12th Examination for the academic year 2018-19 from 15 February to 3 April 2019. The detailed time table is available here. The Board will declare the Class 12th Result 2019 on the official website (cbseresults.nic.in) of the CBSE Board and on examresults.net website as well. You can also check your 12th Class Result on our newly launched Android app. Last year there had been a lot of angry talk from both, parents and students, about the CBSE 12th Time Table 2019 that was released, due to the lack of gap days between exams. This prompted CBSE to revise their time table for Class 12 Boards 2018 and the class 12 exam was postponed last year. Thankfully so far, there is no change in the released timetable for class 12 CBSE exams. 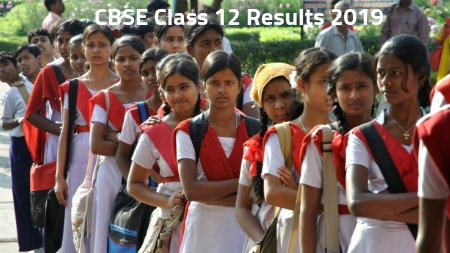 The CBSE Board (Higher Secondary Education) is expected to declare the CBSE Class 12 Results 2019 in May, 2019. The CBSE Class XII Result 2019 determines the future course of study for the lakhs of students who appear for the exam each year. The Class 12th Board exams are conducted by the CBSE every year. The Class 12th examination is the last school leaving examination for students to conquer before gaining admission to graduate programs across the country. The marks scored by students in their 12th standard exam also underlines their eligibility in competitive examinations like the BITSAT and also much sought-after degree programs at universities like DU. The CBSE Class 12 Exams are conducted across several examination centres and the CBSE 12th Results 2019 are eagerly awaited by students across the country. In the year 2018, the CBSE Class 12 Exam was conducted across 4238 centres across the country. The CBSE Class 12 Result 2019 is expected to be announced in May 2019 and students should be able to check the CBSE Class 12 Board Results on the official website or on examresults.net. In 2019, the Class 12 exams are to be conducted from 15 February 2019 to 3 April 2019, and students can expect the CBSE Class XII Results to be announced in the month of May 2019. Log onto the www.examresults.net website. You can also access your CBSE Results 2019 by downloading our Android app now available on the play store. The app will also apprise you of CBSE Result Dates and other board announcements. IVR: At a cost of 30p per minute per roll number, students can access their results through an IVR system. SMS: Students have the option of accessing their results via SMS. It's charged at 50p per SMS. DigiLocker: Students can also access their CBSE board results 2019 via their DigiLocker, the account details for which are sent to your registered mobile number. The CBSE Class 12 Result 2019 date is expected towards the end of May 2019. In 2018, the same CBSE Class XII Results 2018 were released in the last week of May, on 26th May 2018. Detailed below are some of the other statistics related to the CBSE Class 12 Board Exams conducted in 2018. 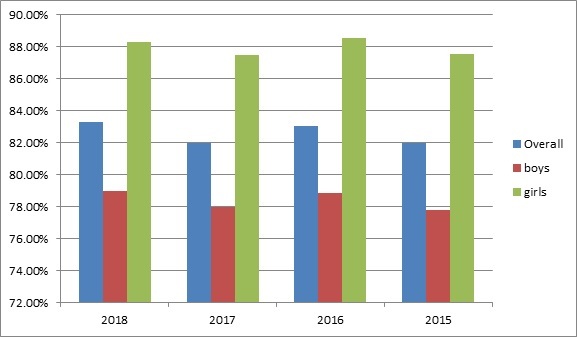 These stats can perhaps help determine the pattern for Class 12 board CBSE for 2019 and also help understand the CBSE Class XII Result pattern. The overall pass percentage of students who appeared in the CBSE 12th Exam 2018 was 83.3%. Last year, approximately 11 lakh students appeared for the CBSE Class 12 boards. The pass percentage and other statistics for CBSE Class 12 2019 will be updated once the 12th result 2019 CBSE are declared. In the year 2018, Meghna Srivastava was the topper of class 12 CBSE exams with 499 marks out of 500. Anoushka Chandra and Chahat Bodhraj were second and third toppers respectively. Thiruvananthapuram had the highest passing percentage of 97.32% in the country. Students who've appeared for the CBSE Class 12 Exams 2019 can check their CBSE 12th Result 2019 on the official website of the CBSE board, cbseresults.nic.in or on examresults.net. Our application available on Google Play store is another means to access your results. The apex board of education in India, CBSE has a pan India jurisdiction and also a global presence with nearly 141 affiliated schools across 21 countries. The board grants affiliation to schools up to higher secondary level and develops common curriculum keeping nationwide requirements in focus. GET COMPLETE INFORMATION ON CBSE - CLICK HERE. The CBSE was given its present name ‘Central Board of Secondary Education’ in the year 1952. The Board was reconstituted in the year 1962 when its jurisdiction was extended. We wish all the students waiting for their CBSE Class 12 Exam Results 2019, Best of Luck!